At MakerBot, we believe there is an innovator in everyone. The MakerBot Replicator+ 3D Printer is our most popular 3D printer for professionals, educators, and hobbyists with a fast and reliable 3D printing experience, right out of the box. 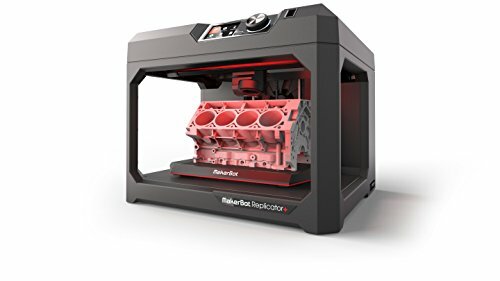 Enhanced 3D printing workflow features including the Smart Extruder+, a full-color LCD display, Wi-Fi connectivity, and MakerBot Print 3D printing software are just a part of what makes the MakerBot Replicator+ 3D printer the preferred 3D printer for both beginners and advanced users alike. The MakerBot Replicator+ 3D printer produces high-quality prints 30% faster than its predecessor and offers a 25% larger build volume. Improved hardware, like a redesigned gantry and Z-stage offer greater reliability and precision—every time. The included Smart Extruder+ has double the warranty of its predecessor and delivers a dependable, consistent 3D printing performance with superior results using MakerBot PLA filament—no matter the project at hand. MakerBot. Ideas in the Making. ***Please note that Amazon is the only authorized seller of MakerBot products on Amazon.com. Products purchased from third parties on Amazon.com may not be factory new and are not covered by any MakerBot warranty.